With a score of 133 the highest voted question was the controversial Which ship can go faster, the Millennium Falcon or the USS Enterprise? asked by g.rocket and answered by Valorum. The second runner up was What did Frodo mean by “He told me the true story”? asked by Noosre with a score of 111. The top answer with a score of 202 was from Daniel Roseman to the question Identify a movie in which aliens believed a sci-fi TV show to be true documentary asked by I Love You. The most viewed question, with 22517 views, was What did Darth Vader mean by “There’ll be no one to stop us this time.” Who had “stopped” Vader—or the Empire—previously? asked by JakeGould and answered by Nathan. The most controversial questions were Which ship can go faster, the Millennium Falcon or the USS Enterprise?, Did Luke really not know about Mos Eisley spaceport in the original “Star Wars” (1977) film? and What was the value of the Shire and everything in it? 9100 rep was awarded from 46 different people, which is an average of 197 rep per person. Tragically my answer to the question How many times does the Elder Wand amplify your magical power? was deleted. But here it is. In Dungeons and Dragons a natural 20 is an automatic hit conferring x2 damage. Why does Captain America’s costume change in all the movies? Creation even received a nice and well-deserved Reversal badge for his efforts too. Fun fact: Logan is currently my favourite comic book-based movie and definitely in my top 5 favourite movies of all time. Who are the oldest characters in A Song of Ice and Fire? I think we should mention the Big Edit Event held on March 11 and 12. After Stack Exchange announced mass HTTPS, it turned out that a metric tonne of images would die if we did not take action. 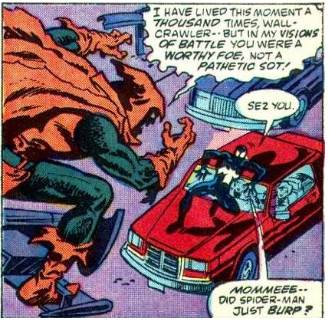 Marvel and DC tags, which have also been renamed from [tag:dc-comics] and [tag:marvel-comics] to [tag:dc] and [tag:marvel], respectively. Any question pertaining to any property of DC or Marvel now has respective tags – courtesy of @CreationEdge, who wrecked the main page single-handedly made ~2000 edits in two days, breaking a site-wide record. [tag:tolkien] [has been burninated]10. Any tag about his Legendarium now has the [tag:tolkiens-legendarium] tag, and the questions about the author now have the [tag:j-r-r-tolkien] tag. Seems about all… Please forgive me if I have forgotten anything! Overall, I think this event was a good and a necessary thing (hugs Copy Editor badge), and a great initiative by the community! What would be the translation of “non-elf” in Elvish? Unfortunately, VoC has been using a different throwaway account for each of their posts, so they haven’t been able to become a high-rep user with site privileges even after all these great answers. Did Lily ever find out that Snape had changed sides? Do wizards get a diploma when they graduate from Hogwarts? What made Death Eaters think that they could take on Dumbledore? Why didn’t Dumbledore appoint the real Mad Eye Moody to teach Defense Against Dark Arts? No offence to anyone not mentioned in this post! I know there have been many great questions and answers from many different users in this quarter; I remember these three standing out to me particularly, but there are doubtless others whose posts I’ve forgotten about or simply not seen. Also, I never bookmarked the best posts even from these users; the above list was pieced together by just going through their question/answer lists and looking for highly voted stuff. If there’s a masterpiece I’ve missed from one of them, do let me know in comments. After suffering the slings and arrows of outrageous fortune downvotes and close votes, his question ‘did the triple‘ (gold badges for Great Question, Famous Question and Great Answer) in less than 2 days. Finn O’leary deserves special mention. His answer languishes in (relative) obscurity despite offering a response straight out of the textbooks. In Star Trek, why do Federation / Starfleet ships always seem to delay returning fire until it’s almost too late? The premise of the question gave me a laugh. I’ll never look at Phasma the same way again. Michael Karnerfors’ response and all the comments to the question of whether the Millennium Falcon or USS Enterprise was faster. For my favorite answers of the quarter, I choose Valorum’s answer for Did Luke play any significant role in “Return of the Jedi?” and my own for Was it implied by the dialogue in A New Hope that the Death Star had never been used before? I’m not sure if it’s bad form to suggest your own answer, but I’ve had a lot of fun writing one about the tallest structure built in Middle-earth, asked by iMerchant who has been contributing some pretty interesting questions about Tolkien, Star Trek and Star Wars. The following is how I usually write any kind of answer that requires a lot of research. People may think I know all of this stuff by heart, but I don’t. I had some ideas on tall structures, but nothing really concrete. It was a combination of prior knowledge, PDF searching and googling (“middle earth tallest structure”) that allowed me to come up with ideas. There’s a lot of information out there that can be used as a starting point, including the various Tolkien wikis and old-fashioned forums, but I have to personally verify everything I find. Some of the stuff I find turns out to be false, speculative or unverifiable. I either don’t include it or add a warning that I couldn’t confirm that particular piece of information. 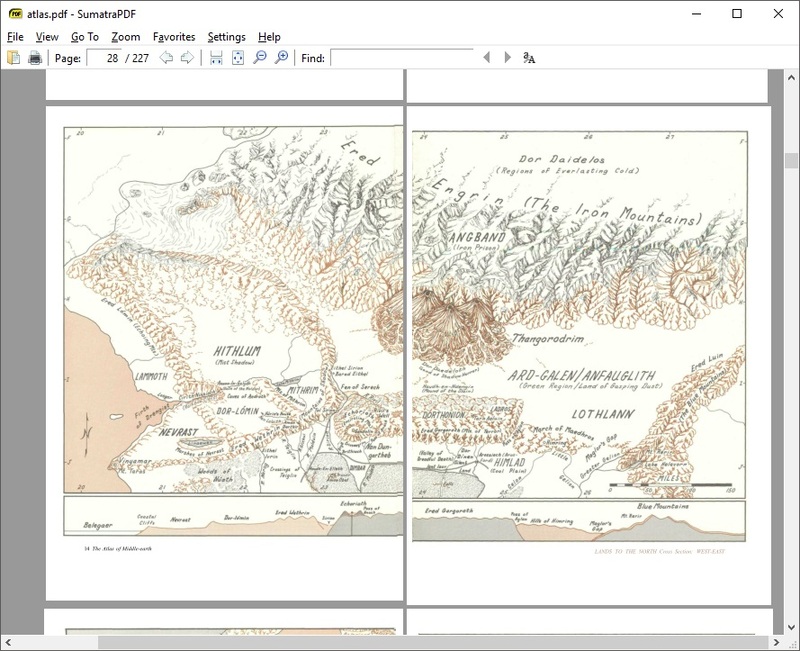 I have all of Tolkien’s main works, plus everything his son published in paper form, but I also have a lot of PDFs of various other documents. They’re all in a folder and I use pdfgrep to search for certain terms in them. It’s not always easy, especially since it doesn’t handle non-ASCII characters very well, so anything with accents is kind of a pain to search for. I once tried converting the PDFs to text files, but it didn’t really help: all the formatting was lost (including table of contents, which are really useful) and non-ASCII characters were either lost, converted (é to e) or broken (é to e´), which made it even harder to search for. Although pdfgrep is slow and clunky, it’s best I’ve found yet. In some cases, I can either search for only part of a word if it’s unambiguous (Oioloss for Oiolossë) or use regular expressions (F\w+nor for Fëanor). In his question, iMerchant mentioned “man/Númenórean/elf/dwarf/Maia/etc-built structures”, which gave me the idea of splitting my answer by race. My initial idea was some of the taller mountains built by the Valar, such as Taniquetil, but he said geographical features did not apply. My initial guess on the tallest structure overall was Barad-dûr, but I still started with the pillars first (even though they could be considered “mountains”) because they are for me the largest project ever undertaken on Middle-earth. Elves gave me some trouble, as they never really built anything fancy, as far as I could tell. I searched through all the PDFs I have for terms like “tower”, “tallest” and “highest”, but couldn’t really find anything interesting. I also found various lists of buildings for more ideas, but all the suggestions in this part are speculative. Same thing for orcs. Dwarves were easy, especially since b_jonas had given the answer first. I initially made a mistake for Men. I honestly didn’t think of Minas Tirith and went for a tie between Orthanc and Armenelos first. It was only by going through the Atlas of Middle-earth for ideas that I saw Minas Tirith. That’s why there’s a weird “second place” subsection, where I kept my initial guess. Then, while re-reading my answer on Dwarves, I thought of Melkor and Angband and integrated that in the “Valar” section. I also had some issues with people editing my answer as I was writing it, creating some edit conflicts which, apparently, Stack Exchange is not very good at dealing with. Once I was done with the meat of the answer, I did what I usually do with all my answers: add a proper introduction, some touches here and there (such as conversions into meters) and some links to various articles. I also know people like having pictures, especially those from the Atlas, so I added some for Moria and Minas Tirith. Since I’ve bought the Atlas, I don’t feel too bad about having a PDF and uploading low quality versions of the images. This requires some work: taking a screenshot of the PDF, opening it in Paint.NET and cropping it correctly. Some images (like Thangorodrim) were split in two pages, so I had merge the images, but they weren’t exactly aligned. I had to rotate them until they (mostly) looked good. If you look closely, you can see some repeating features that shouldn’t be there and a pretty visible seam. I spend a lot of time re-reading my answers to find typos (ugh! ), badly worded sentences or things I can add here and there. I usually find a lot of small things on the next day because I can look at the text with fresh eyes. 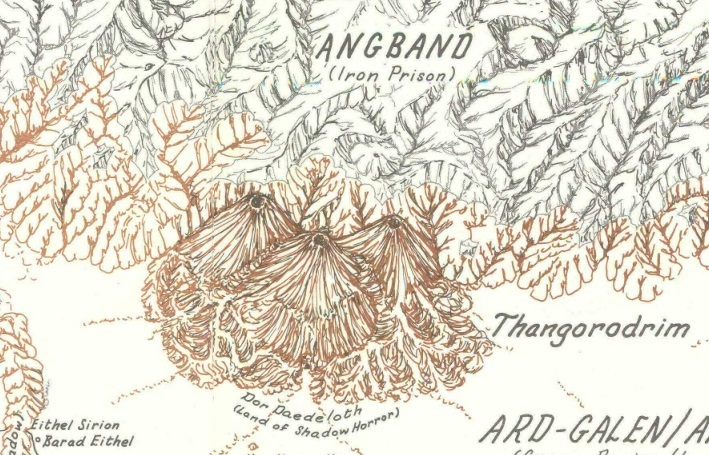 So I went back to Angband and Thangorodrim, because that part had been bugging me. I added more information on the height, including a drawing from Pictures, to make it clear that the estimate from Fonstad was based on some very flimsy evidence. The picture I initially included was a colored version, but I swapped it last minute with the original black and white. Although it doesn’t look as good, it makes it clearer that there’s not a lot of details. Finally, once I was done with writing and formatting the whole thing, I went back to all my quotes and added citations for them. All the quotes I include in my answers come from various PDFs I have of Tolkien’s works. They’re easier to search and copy/paste, but they usually have weird page numbers (if any) that don’t really correspond to anything. So I get my books out and search for the quotes in them. It’s the part I hate the most when I write an answer, which is why I usually wait until the very end to do it. While I was still working on the answer, people were starting to comment on it (I love it when that happens). I integrated information on the Temple’s dome (from Paŭlo Ebermann) and clarifications on Moria (from Withywindle). iMerchant had a follow-up on the Paths of the Dead, but I didn’t include it in the answer because it wasn’t relevant. Finally, Olivier Grégoire asked about the Hobbits. I had thought of it and did some quick searches at first, but I assumed (correctly, I think) that they wouldn’t have built anything tall since they are uncomfortable with heights. From my first comment on the question (“I have a feeling I’m going to spend way too much time on this question”) until my last edit on the same day, I spent about 5 hours. That’s typical of this kind of answer. It’s a lot of work, but I love it. Keep those questions coming!